There can be a lot of reasons to book Ijen tour package for your upcoming holiday to Indonesia. When Ijen tour allows you to witness the magical and breathtakingly beautiful view of the Ijen Crater and its popular blue fire, you may like to add a cultural seasoning to your tour. At this point, coming during the Barong Ider schedule must be perfect. Barong Ider Bumi is basically a unique tradition held by Osing people of Kemiren Village in Banyuwangi. This traditional custom ceremony is regularly held on the second day of Syawal Month in Islamic lunar calendar. If you book an Ijen tour package after Ramadan month in Indonesia, you will have a chance to watch this tradition. 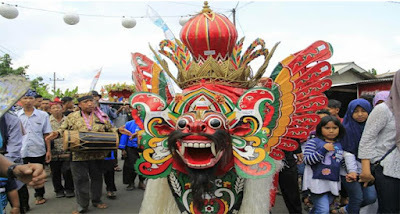 This tradition has routinely attracted a lot of tourists to visit Banyuwangi. It is presented with a perfect packaging that guarantees the visitor to get the most of their time while in Banyuwangi. It is basically a ritual to clean the village. But, when you combine it to your Ijen tour package, you will find that the ceremony also presents a unique Barong parade. Then, why should you bother to consider watching Barong Ider tradition within your tour to Ijen Crater? Well, there are actually some reasons why you shouldn’t miss this tradition while you are in Banyuwangi. For sure, your Ijen tour package will be richer and there are some other reasons that make you better consider it further. Just like many other traditional custom ceremonies practiced in Indonesia, this tradition won’t be repeated more than once in a year. For the Barong Ider tradition, you can also meet it after Ramadan month and you won’t be able to find it on any Ijen tour package which is offered outside the schedule of this ceremony. The barong parade is surely something that is worth checking for. You will be able to see the barong got paraded around the village with Angklung played in the background. Then, can see people spread coins, flower and yellow rice during the parade too. There is no doubt it will make your Ijen tour package even more interesting. After all, you are still around Banyuwangi and you can continue to enjoy the beauty of Ijen Crater after witnessing this custom ceremony. It is common for tour agent to encourage you to leave early in the morning for an Ijen tour package. You can consider staying in a hotel that has a good access to Ijen Crater for this reason. So, it is a tour that is worth checking for, isn’t it? If you feel attracted to join a fun tour to Ijen Crater and a time to explore Barong Ider tradition, you can discuss your intention with the best tour agent around. Here, we recommend you to use www.jogjabromotour.com to find your best Ijen tour package.